Lot Detail - Abbott’s Deluxe Drawer Box, Signed. 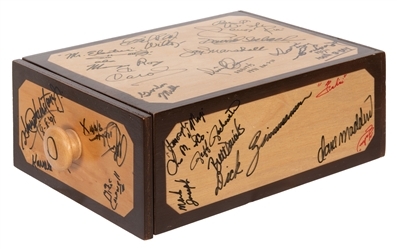 Abbott’s Deluxe Drawer Box, Signed. 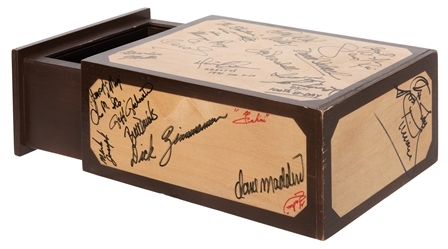 [Abbott’s] Abbott’s Deluxe Drawer Box, Signed. Colon: Abbott’s Magic Mfg., 1990. Sturdy wooden box shown empty, then fills with animals and scarves. Signed by attendees and performers at Abbott’s 1991 Magic Get-Together, including Harry Blackstone Jr., Karrell Fox, Gordon Miller, Jay Marshall, Mike Caldwell, Senor Rai, Mr. Electric, Earl Ray Wilcox, Skilldini, and years later, by John Calvert at Abbott’s on his 100th birthday (August 5, 2011). With instructions.